Coq au Vin is cozy winter food. It’s meant to slow cook and, like many stews, tastes even better the day after it’s prepared. 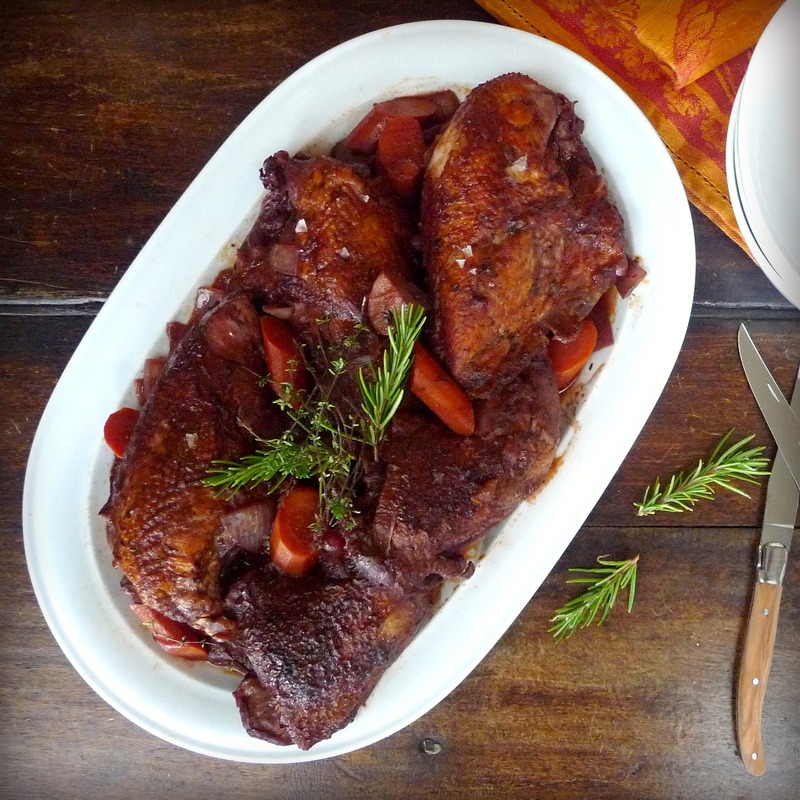 I’ve come across recipes for quick Coq au Vin. 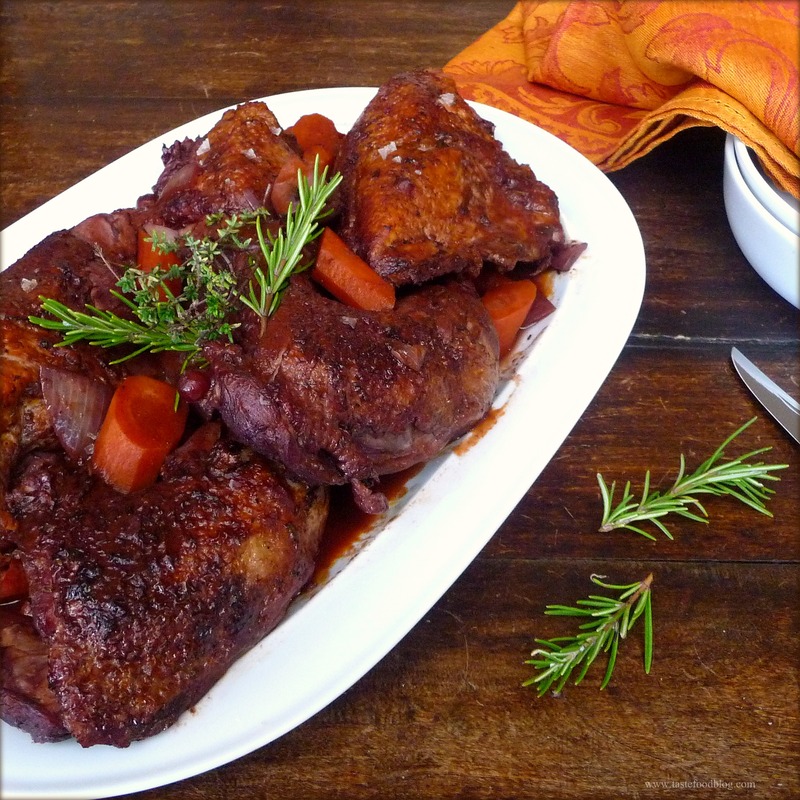 This option sounds ideal for a busy weekday night, but, if you ask me, I would rather save my Coq au Vin for the weekend when it can simmer away, filling the kitchen with warmth and the aromas of wine and herbs, while building anticipation for dinner to come. Traditional Coq au Vin required slow cooking, since it called for using a tough rooster as its main ingredient, which benefited from a long cooking process to tenderize the bird. Nowadays, chicken is commonly used, and the length of cooking time is shortened. Nonetheless, the dish is best when left to simmer over low heat, and the sauce is allowed to reduce and thicken into a luxuriously rich stew. In this version, I omit the bacon and use a generous amount of brandy to deglaze the pan. Tomato paste is added to round out the sauce with a touch of sweetness. I like to slow-cook the stew in the oven at a lower temperature, freeing up the stove top for other needs. In the meantime, I am free to get on with other tasks, or relax with a book and a cup of tea or gløgg. This is the epitome of winter weekend food, preferably when the weather is cold and dismal outside. As an option to butchering a whole chicken, purchase 2 whole legs and 2 to 3 breasts with skin and bone intact. Serves 4 to 6. 1. Preheat the oven to 325°F. (170°C.) Heat the oil in an oven-proof pot with lid or Dutch oven over medium-high heat. Add the chicken pieces, skin-side down, in batches. Brown on all sides, 4 to 6 minutes. Transfer to a platter. 2. Carefully add the brandy to the pot (it will steam) and stir to deglaze the pot while you let the brandy reduce by about half. 3. Add the garlic, carrots, onion, and mushrooms, and cook for about 3 minutes, stirring frequently. Add the wine, tomato paste, thyme, and bay leaves. Return the chicken to the pot and nestle the pieces in the wine. Bring to a boil and then reduce the heat to a simmer. Cover the pot and transfer to the oven to cook for 1 1/2 hours, stirring occasionally. 4. Transfer the pot to the stove top. Remove the chicken and vegetables with a slotted spoon and place in a large bowl. Boil the sauce over medium heat until reduced by about half and thickened to a sauce consistency, skimming the fat, about 20 minutes. Add the sugar and salt and pepper to taste. Return the chicken and vegetables to the pot, and gently simmer to thoroughly heat through. 5. Serve warm in low bowls with mashed or roasted potatoes. That sounds so great right now in this dreary cold weather we’re having. I have yet to mak Coq au Vin and will have to give it a try. Thanks so much for the link! Diana, I hope you try it. It’s a perfect cure-all for dreary weather. I haven’t made this is ages and the weather is perfect for your updated version. How you get such lovely photos of “brown food” is beyond me! Thanks, Liz. I think we’re both experiencing lots of rain right now.